James Galway and Michala Petri — Flute and recorder duet. 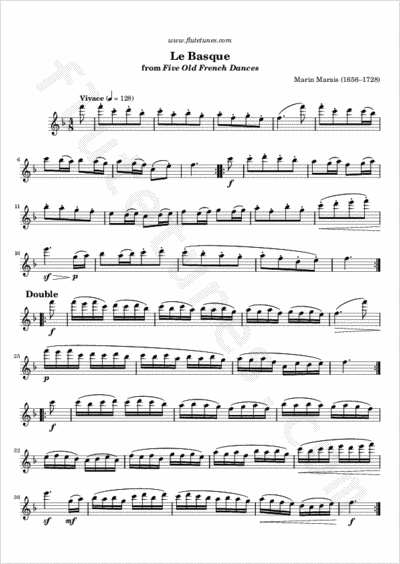 This famous one-minute piece was composed by French viol player Marin Marais. The viol (also called viola da gamba, an Italian expression indicating that the instrument is meant to rest vertically on one's leg) is an old instrument that was primarily used during the Renaissance and Baroque periods. It is similar to a cello, but it has six strings and it is fretted like a guitar. “Le Basque” is a quick and joyful dance; those who speak French will probably observe that in France the phrase “courir comme un Basque” means “to run like a hare” (literally, “like a Basque”). Probably because of its short length, today the piece is used by many performers as an encore piece. It was also recorded by James Galway on his album Annie's Song.